duggan, infinite horizon, noto, whatever happened to Infinite Horizon? now apart from the fact that #5 finally arrived, the real nice surprise is that it is a lovely bit of cover art. It almost made me forget about the 2 and a half year delay between issues. 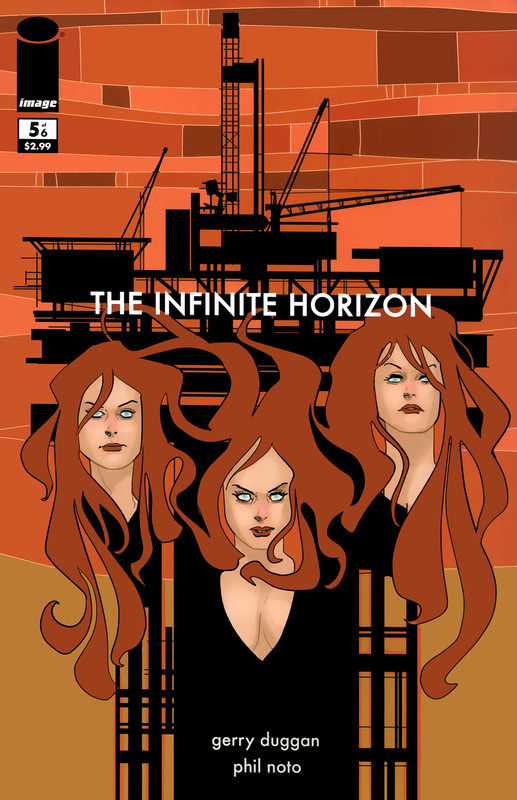 duggan, image comics, infinite horizon, noto, whatever happened to Infinite Horizon? Whatever happened to Infinite Horizon? The frustration of the comic book reader and awry scheduling. ‘The Inifnite Horizon’, and updating of ‘The Odyssey’ to reflect a modern day America and its troubled relationship with the Middle East, was given much fanfare and attention late last year by Image comics, who were to publish the 6 part series, and the comic community at large. The initial episodes lived up to the hype, with both the story (by Gerry Duggan) and the art (by Phil Noto) being high calibre and individual enough to stand out from the ranks of superhero titles. The first 3 episodes had been shipped by Spring 2008, but since then – nothing. No news on the official creator site www.the-infinite-horizon.com. Try googling for news – nothing, just the solicitations for #4 and onwards. Considering this was a title that justified the hype, it seems a great shame that we may not get the chance to finish reading this story. Or maybe it will come out in another year or so. But will anyone care? You can expect delays when it comes to comic book scheduling and releases. You need to be patient and allow a month or 2 of no releases on a title – but a 6 month delay? Longer than 6 months? It smacks of trouble, and inevitably there will be frustration, and ultimately indifference, on the part of the reader, the person who has put it on their pull list. The person who has been led to believe a 6 issue series should come out in regluar instalments. When issues fail to ship you lose continuity (which can always be remedied by reading the previous issues again), but more fundamentally, the reader can lose faith in the product.